I just put down a deposit for a 1964 R27. It has 17,8XX miles. The bike is in fair condition and looks to be all there. I pumped the kick starter a couple of times and heard compression in the cylinder. The seller is a cars for charity and acquired the motorcycle through the relatives of the deceased original owner. 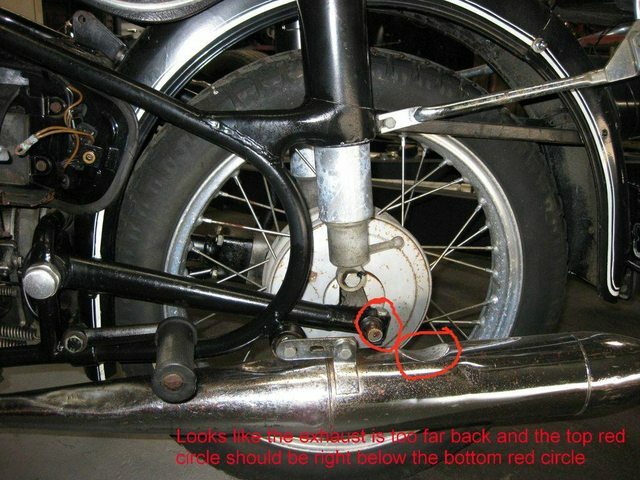 The seller stated that the bike hasn't been started since 1978... the last time it was registered. I'm going to go back to the seller with some engine starter fluid and a new battery is there anything else I need to try to start the bike? Does anyone have any advice or tips on what to look for in this particular bike and if there is anyone that could recommend a mechanic that could look at the bike before I fork over the rest of the balance? I'm located in San Jose, CA. I'm really excited, but also scared sh**less that I'm throwing my money away. BTW the seller is asking for $4,200, I've done some research and found out that $4,200 is way too much, I'm sure I can talk him down as soon as I find all the faults on the bike, what do think would be a reasonable offer? Edit: Tank is not rusty, Hooray! What does your research show as a more reasonable price? Actually, $4200 doesn't sound all that bad for a bike that is all there. Yes, you're going to spend some coin getting it running again, but you would probably do that for a bike that hadn't run 5-10 years ago, let alone 30. 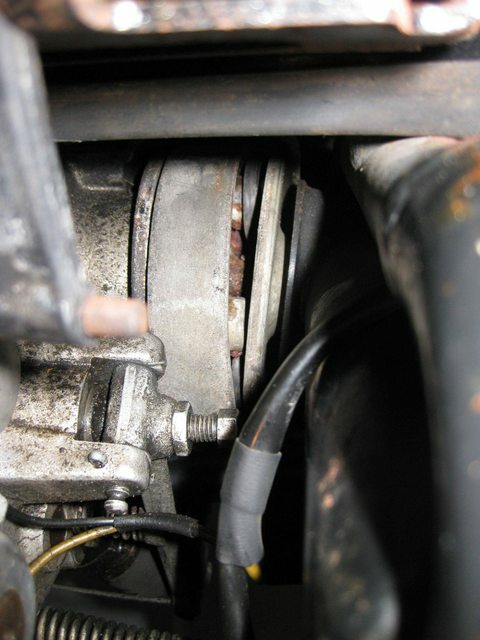 You could remove the spark plug and put your finger over the hole and see how much compression you're getting. The fact that the cylinder is not seized is a good sign, compression is even better. Since you're probably going to need to disassemble this pretty soon in your ownership, I think you're in good shape. If it were me, I would not start the bike with the existing oil...I would not want to drag that stuff back through the engine. As a minimum, I'd drain and refill with new oil. It wouldn't take much more to drop the oil pan, clean the sludge, replace the gasket, and refill. My guess is the carb jets will be mostly varnished over and wouldn't work hardly at all. Might also be worth dropping the bowl and spraying some carb cleaner around to help with cleaning some of the crud away. I'm going to take a contrary stand to Kurt, even though he is much more knowledgeable and plugged in to the singles. Yes, the bike looks pretty complete, but you're going to spend a lot of money getting it whipped back into shape. A perfect condition single is probably limited to under $10k in value -- I saw a very nice one sell at the Quail Lodge for $8k last month. So you can be very limited by what you do before you're under water on the project. $1-2000 to go through the engine, $1-2000 to paint and pinstripe the bike, a couple hundred for chrome work, money for getting the tank cleaned and lined, whatever you find in the carb, the generator, transmission, final drive, new tubes and tires... plus your own time. You can see where this is going. You should definitely try to talk them down. I don't want to try to talk you out of this, but you should go into it with your eyes open. The singles are cool and are getting more attention, but they cost nearly as much to restore as a twin and honestly will never have the value of a twin. I cleaned up the photo so i could see the bike. I agree with both Kurt and Darryl. They are true experts. Were I you, I would take Kurt's approach first. I would want to hear it run. Darryl is right -- it looks pretty complete and clean. Even has tire pump. 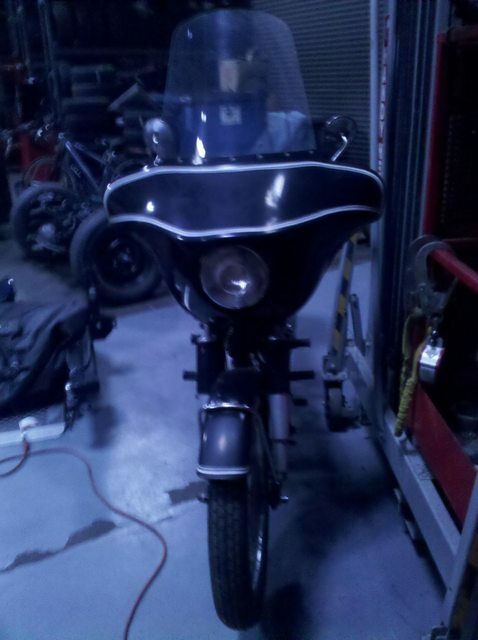 Were it me -- and I had bought it -- I would get rid of the Wixom fairing and the top case and rack. The fairing has a huge windshield and you do not need to have an 18 HP R27 pushing that around. Sell them and get a little cash to help your project. Darryl is correct about the cost of parts, etc. My best friend is working now on an R69S and was shocked at the cost of parts. Be ready to open your wallet. Darryl is also right that singles are cool, but will never reach the value of twins. So if this is an "investment," look for a twin. If it is for love of the BMW single, that is another story. I still have an R25/3, but I sold all my R27s long ago. If I do purchase the bike, I'm definitely remove that ugly fairing, case, and switch the seat to the more sexier springer. As the owner of an R27, among other vintage Beemers, I am drawn to make a comment or two. I bought my '66 about five years ago for $3,100. It had only 3,300 miles on it, was all there but had been neglected and was in need of attention, and came with about $500 worth of extras because the owner had lost interest. The paint was very good with a few chips here and there which I touched up. The pinstriping was complete and perfect with only one quarter inch break on the side of the tank. Chrome wheels pitted; spokes, handelbars, bar risers, shifter all pretty rusty; original seat perfect; tank interior perfect as near as I could tell; hardware about 99 percent original. Not running when I got it but started on the third kick after new battery, points, condensor, and coil. Many rewarding evenings spent in the shop dismantling things, cleaning up the paint and hardware, fiddling and adjusting. Much time on eBay finding two correct Weinmann aluminum wheels and other bits and pieces. Also many little boxes from Vech and Blue Moon Cycle. She has turned out better than I thought she would and today I have just over $6K in her. I'll have more next winter after a slinger and re-seal job. More than she's worth on the open market? Maybe. Maybe not. I don't care. She is a hoot to ride; much more flickable than a twin; and I enjoy having what, to me, is an integral piece of BMW motorcycling history in my little stable: the last of the air-cooled, shaft-driven singles which were in (more or less) continuous production in various models for some 41 years. She is only 1,101 units from end of production. All that being said, would I do it again? Heck, yes. Would I do it if she were going to be my one and only BMW vintage motorcycle? Probably not. If that were the case, I would have to go with a twin. I do not know exactly where you are but Irv Seaver BMW in Orange, CA would be my first choice, listen to Evan as he KNOWS ALL. I hace a buddy who runs a Brit-bike shop in San Diego (Trophy Cycles, see Tim) and he is very good with vintage bikes (but he is not a "BMW-guy"). I'm located closer to San Francisco than LA or SD. LA is about a 6 hour drive from where I live. So I went back to the seller today and took better photos with my point and shoot and realized that the gas tank was not rusted, I didn't know that the tank was lined in a orange paint, and it looks pretty clean except for the gas cap and the seal around the tank. I did a more through check of everything and saw that the battery cover was missing, is that easily replaceable? One HUGE concern I had was the connection between the transmission and the drive shaft. 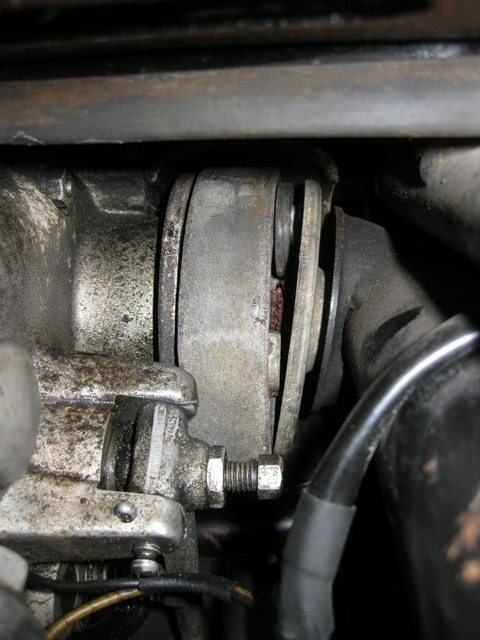 There is a noticeable space between the two and some kind of loose collar or spacer that connects the two parts together. I've attached three pictures. You can see that the collar can move freely, and when I move it to the side you can see all the rusty bits in the drive shaft. What is happening here? Please let me know if this is a deal breaker or $4200 seems reasonable based off the new photos. 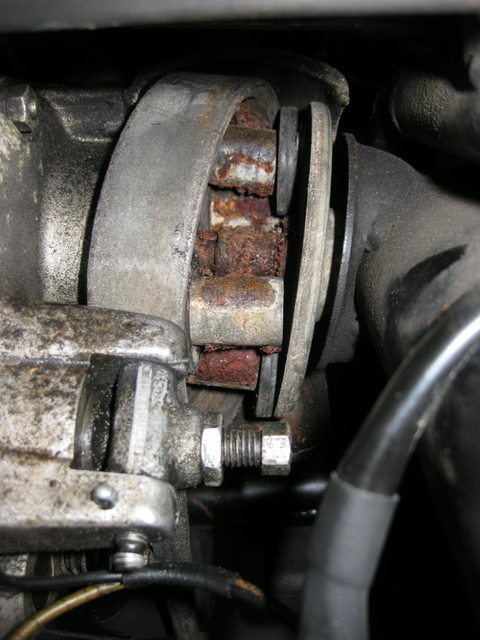 The driveshaft should have a rubber "hockey puck" called a Hardy disk inside that steel ring. The disk has 4 holes, two for the prongs on each flange, and a center hole that keeps the flanges lined up. Looks like someone might have had a go at replacing it, but they're difficult to replace because there's also a steel lock ring that snaps into a groove on the inside of the steel ring and also fits into a groove on the circumference of the Hardy disk. You can get the parts separately, but I've only ever seen them assembled with an arbor press and a tool kind of like a piston ring compressor. It looks to me like someone fitted the muffler from a twin on your single, and it's a bit longer than the right piece. I don't see anything that would make it a deal breaker for me, but I still think the price is too high. Is that a tear in the seat? This is a bike that will soon need to be gone through, from stem to stern, and you should be looking at the prices on Vech's website for the things you can already see you're going to need to fix/replace. And you will need to be handy doing a lot of the work yourself, if you want to keep this project within bounds. No, those are the keys. What do you think would be a more reasonable price? $3,500? Here in Germany there are many more singles alive, so there are all parts available. But You should be prepared for big expenses especially for sheet metal parts (battery cover). From the protos i would not repaint but just touch up the paint - it looks like a nice survivor. The missing Hardy disk means the previous owner took the service not too serious - You hear and feel it long before it is gone. The R27 Motor is a very high reving engine so there is a good chance the slingers fill up faster especially when riding with old oil. After This long time dip in the stick - the oil should have separated and all sluge sank down in the oil pan so it would appear totaly clear. If You take a longer stick and scratch at the ground there could be a substance like tar beneath. So the first thing to show the seller should be the tar on the stick which should be argued as a sign for big expenses in slinger cleaning (google BMW slingers). (You may run the motor after cleaning the oilpan anyhow for a time it it does not sound to mechanical). After 30 Years of just standing around there is a high risk, the tank might have rust in the eges near the seat You can prove it with one of these cheap USB endoskopes for Your laptop. Personally i would take the machine apart, touch up the paint, grease all bearings, change the oils and do a slinger service. On the german market the machine should be technical OK and running good for this price. An offer of 3500 would be ok, under 3000 would be good. Wow you are totally correct about the oil, I forgot to mention yesterday that the oil looked brand new and had the viscosity and color of olive oil, but it didn't smell like fresh oil. 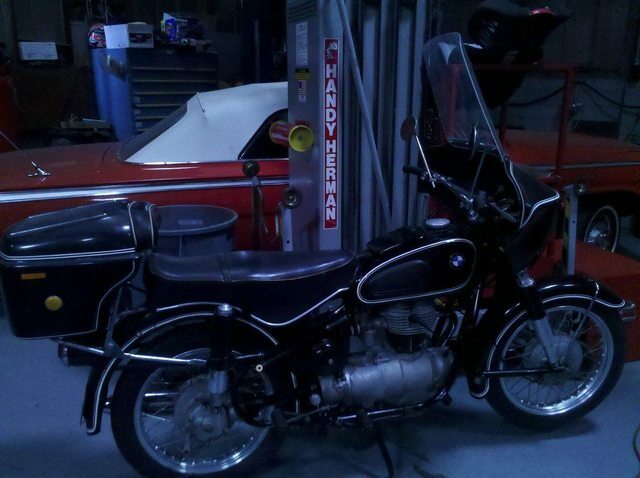 Thanks for your help guys, I'm going to try to talk the seller down to $3k and go from there, I'm very excited that I'm armed with this new knowledge on vintage BMW bikes. Depending upon what level of restoration you want to undertake, there's a lot that needs to be done. And that's just what we can see. But there's a lot to work with and a lot of things you can undertake in a low-tech sort of way like cleaning the carb, replacing the cables, cleaning up bits and pieces, and painting small things like the under-tank brackets, hubcaps, etc. The wheels are aluminum and look like they might clean up presentably with a lot of elbow grease. Spokes and tires look pretty well shot to me, though. The paint doesn't look all that bad and I think that a little experimentation with cleaning it up and waxing it would certainly be in order before you leap into a re-paint. The pinstriping also looks good. Don't go crazy with cleaners on the pinstriping, though. At best you'll thin the stripes out and at worst they'll disappear. It's only original once, so I'm always in favor of preservation to the extent possible. As for price, I'm in agreement with previous comments. No more than $3,000. Regarding the battery cover, I thought they were NLA but Vech (Bench Mark Works) is showing the cover complete with aluminum kickplate and painted black for $201.50. The part no. for the cover is 61 21 8042162 and the no. for the kickplate is 61 21 8042160. The last cover I saw on eBay needed paint, had no kickplate and still sold for more than $100.00 so Vech's price seems good, although it's a glimpse into the high cost of parts for these bikes. If you're looking for advice, I'd say don't do it unless the bike is going for a very friendly price ($2500). Do you really want a non-running single? There are some pretty good deals out there on running twins these days. Keep an eye on ebay and you'll get a good idea of the real selling prices. Here in Colorado at altitude, a big man on an old single is for coffee shop rides only. These things are charming but very slow. 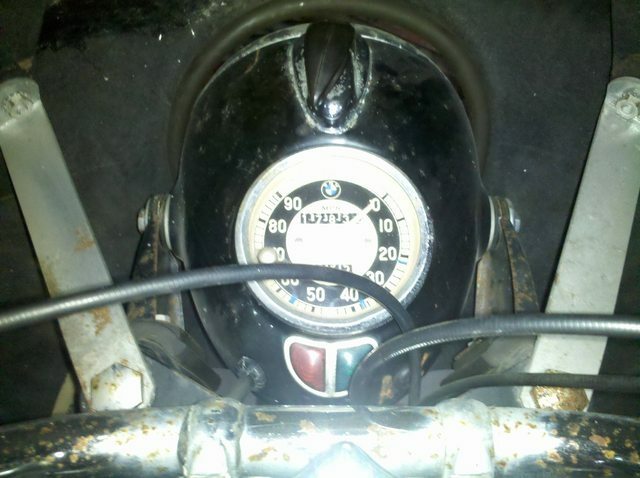 it's true that it will take big bucks to restore any old BMW these days due to the cost of parts and the fact that some of the mechanical procedures are fairly complex for a simple bike, do require some special tools, and you can really screw up if you don't know what you're doing. It's also hard to find folks to work on these things. Most BMW dealers won't touch them. IMHO it would be insane to hand this over to one of the resto. experts and have them do it all for you. I'm no expert, and when I got into these bikes I didn't feel like spending a ton of time and money learning how to restore one myself. The last two /2 bikes i purchased were all done and sorted, and that has really worked out for me. They are fun to ride, get tons of attention, and are very reliable once they are set up correctly. My advice is to save your money and buy a redone or well cared for original /2 and be prepared to spend about 8-10K for it. You'll have a lot of fun doing the simple maintenance and tune ups, you'll be able to keep up with traffic and get on the highway, if necessary, and if you decide that you want out, there will be a much better market for resale. Thanks everyone for the advice. I decided to walk away from the bike. Some other guy in Sacramento was willing to pay asking price for the bike and I couldn't compete with that. Hopefully the guy from Sactown know's what he's getting into. It was the bike that sat above the service department at San Jose BMW for about 15 years. It is undergoing a mechanical restoration and everyone here is right. There is a lot of time and money invested. When it is done, it will be unique to be on the road for sure. Will it be worth thousands? Well the market determines that. But a running registered complete bike should see over 5k. The bike on CL is worth it, but they are looking at a lot of teardown to make sure the slingers, chain etc internally are in good shape to run. BTW recently there was another R27 in the San Jose area that was picked up for a song that is in the same shape as that one on CL. If you don't mind me asking. How much did you buy the R27 for? And what kind of work/money are you invested into the bike? I got the bike as a trade/goodwill deal. It was worth it. So I have a few bucks into it. It now cost more than my /5 -but is worth more. I rode the thing before I decided to "fix it up"
2kick bike ran like a champ. Opened it up and found the top ring on the piston broken in nine spots so it jumpstarted a mechanical rebuild.. I have reciepts and pics.